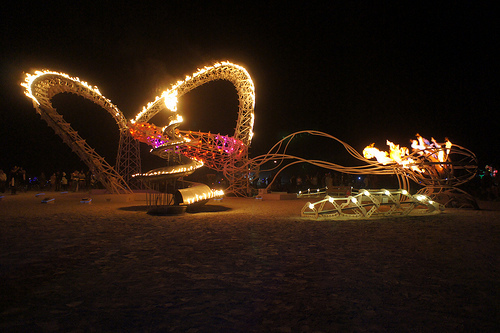 Tympani Lambada is a sculpture by the Flaming Lotus Girls inspired by the anatomy of the inner ear. 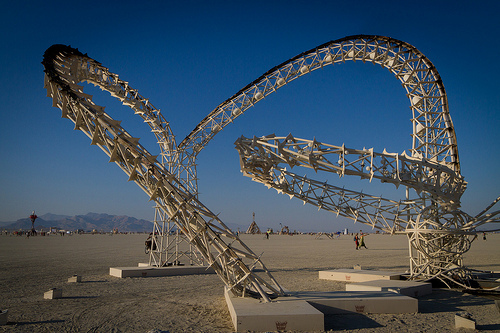 The three soaring arches represent the vestibular system, which controls balance, and the spiraling methanol fountain represents the cochlea, which is responsible for the perception of pitch. 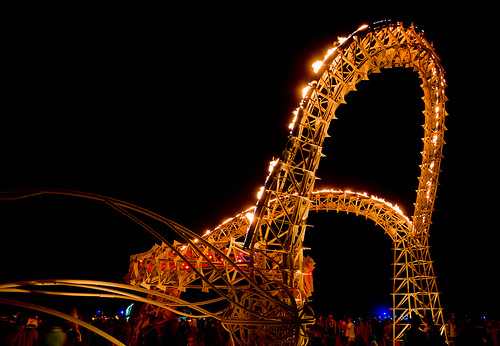 The sculpture incorporates sound, sequenced LED lighting, and of course the FLG's signature flame effects. My main contribution to this project was developing a strategy for translating the CAD model of the arches into a physical reality. At times I may also have been spotted troubleshooting, wire-running, wrench-wielding, and loose-end tying. Photos by (1) Caroline Miller (mills) and (2,3,4) Michael Prados.